I was travelling to Bangladesh for the first time in 2017. I told my mother that I was going for a business trip and if all went well, I would be travelling frequently to Bangladesh. She sat right up, her eyes sparkling. She had spent the first 10 years of her life in Jaidevpur in the district of Gazipur, 30 km north of Dhaka, the capital of Bangladesh. It was then a part of undivided Bengal in India. 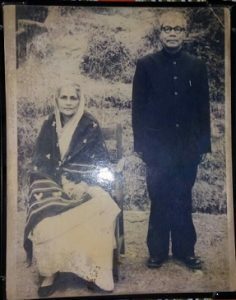 She told me that she had grown up in a palace as her great grandmother was Princess Indumoyee, the eldest daughter of Raja Rajendra Narayan Roy, the ruler of Bhawal, a large zamindari1, estate in Bengal. The property of Bhawal covered most of present day Dhaka. Indumoyee was the elder sister of Raja Ramendra Narayan Roy, who was made famous by the controversy surrounding his death. Ramendra Narayan ‘died’ in 1909, but suddenly re-emerged after 12 years! This then resulted in a widely followed legal battle between the Zamindar (Ramendra Narayan) and the British Indian government, in the course of which it emerged that Ramendra Narayan had been slow-poisoned by his brother-in-law and family doctor, resulting in him falling into a deathly stupor and mistakenly taken to be dead. His body was carried to the riverside to be cremated but because of a heavy storm, the cremation had to be abandoned for the night. When everyone returned the following morning, the ‘body’ had disappeared from the funeral pyre. Nobody knew where the body had gone or how! The British Court of Wards2took over the zamindari and people soon forgot all about the disappearance. But then Ramendra Narayan suddenly turned up in Jaidevpur in 1921, taking everyone by surprise! He looked very different, dressed like a hermit (or sanyasi) and speaking in Hindi3, not Bengali. Some members of family accepted him as the Raja, but some didn’t and amongst those who didn’t were his wife and her brother! The British Court of Wards refused to accept him as the real Ramendra Narayan and declared him an imposter. Then ensued a long two-year legal battle, which Ramendra Narayan finally won. By the time my mother was born in the Bhawal Rajbari (Palace), Ramendra had been reinstated as the Zamindar. She remembers him, as a very quiet and solemn man, sitting in a room in a section of the house that the children were barred from going. 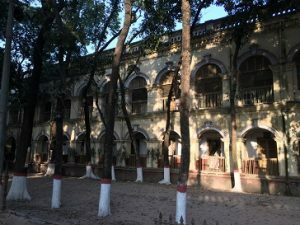 My mother spent many happy days in the Rajbari – playing hide and seek with her friends in the huge library, going to school that had been set up by her family with her cousin Shipra, escorted by a maid. 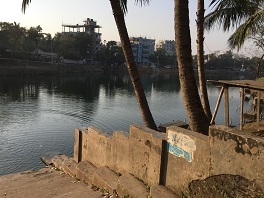 She loved swimming in the Rajbari pond, along with her siblings and cousins, getting told off for spending too much time in the water. Ma remembers the big golden throne, the grand chandeliers, the large modern bathrooms with running water and the silver horse carriage called Tomtom, which used to take the Raja out and about. The Raja would also use his elephant to go out –the elephant would sit down, put his trunk down for the Raja to climb up and sit on the ‘howdah’4. The Raja followed a strict routine and my mother still recalls that at 3pm every day, a family retainer, whom she called Sachin-da5, would bring fresh coconut water in a stone glass for him. The Raja always had ‘rotis’6 for dinner, dripping in ‘ghee’! At dawn every day, the Rajbari would awaken to the sound of the conch shell7. The Raja loved hunting and there was a room in the Rajbari, where his large collection of guns and rifles were kept. But he also had a zoo with tigers, peacocks and other beautiful birds – his favourite was a tiger called Sundari8. He loved dogs and my mother particularly remembers one called Max. My mother’s idyllic childhood came to an abrupt end when in 1947, India gained independence but due to Partition9,had a line drawn through Bengal, making Jaidevpur a part of East Pakistan. Most Hindu families had to pack their bags and flee for their lives to India. 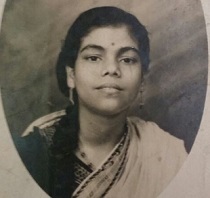 Tears well up in her eyes as my mother narrates how her mother hurriedly gathered up her jewels and some cash and left the Rajbari with her seven children and a suitcase. My great-grandfather was away on work when the family had to leave, but he had organised the trip and asked his friend to help the family escape from Jaidevpur. There was riots and rampage everywhere, with looting, killing and other inhuman happenings – these were bad times when most people’s wicked side emerged. Every time my grandmother and her family were stopped, she would buy her way out with a gold ornament or two. When the family finally reached Kolkata in India, she had hardly any jewels left. My grandmother’s brother, Utpal Mukherjee, then a businessman in Kolkata, put this family of eight, up in his house. But there were other relatives who had taken refuge in his home, so my grandmother and her children had to all cram into one room. This was indeed a very difficult period for the family – quite often my mother and her siblings would be split up between her uncle’s house and that of other relatives so that they could all sleep properly. There was hardly any money and life was tough. But things started to get better soon – my mother’s father managed to make it across the border and finally found a job with the government in Delhi – this job came with a house and at last, the family was together again when they moved to the Pandara Road10house, where they lived for a good many years. 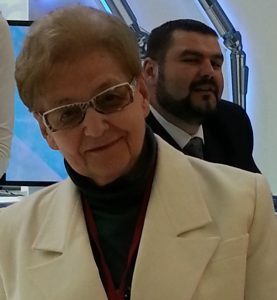 The family was still there when my mother met my father and got married. People affected by the Partition were all being allotted land in Delhi and as a refugee from East Pakistan, my grandfather got a piece of land in the locality in the south of the city, called Chittaranjan Park, where he built a house – a house that I have spent many happy holidays in as a child. As I get ready to leave and catch my plane to Dhaka, my mother opens her almirah and gives me a card. It was a card announcing the funeral of the Raja when he died in 1946. She tells me that I should try and visit the Rajbari if I can and if it still exists and take some photos of the palace. She says that I should show people the funeral announcement card if they don’t believe that I am related to the Bhawal family. She wonders though, if anyone still remembered the Bhawal family now. I take her blessings and leave for Bangladesh. 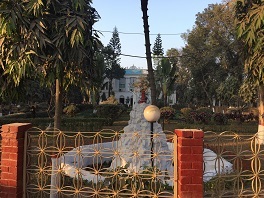 After my business meetings, I mention my Bhawal connections to my colleagues there – it turns out that not only do they know about Bhawal and the family but they also told me where the Rajbari is, just a few miles out of Dhaka. 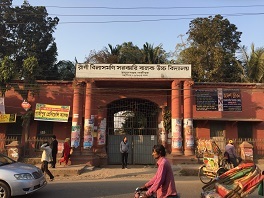 They took me to the Rajbari, front part of which is now a government office and in good repair. The rest of the house and land seems to be in need of some tlc. It is difficult to describe how I felt as I stood there – on the land of my ancestors, in the place where my mother laughed and played as a little girl. I took several photos of the house, the school, the pond and the gardens, promising myself that I will bring my mother here as soon as I can. 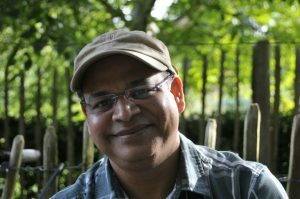 Manash Chatterjee, a Plant Scientist and Entrepreneur, divides his time between Cambridge and Mumbai. What a beautifully told story, Manash! Wonderful, too, that you've 'recorded' the story here for posterity. Life doesn't always give you the opportunity to retrace your roots – so glad that you got the chance and made good use of it. Looking forward to a follow up post when you take your Ma to Jaidevpur. Manash, I didn't know that you have ancestry in Bhawal Zamindar's family. The famous Bengali movie 'Sannyasi Raja' is based on the story of yours maternal family. One Bengali TV serial is also running now. My wife is fond of that serial.